LOWER EAST SIDE, Manhattan (WABC) -- New Yorkers are coming out in droves to the New Museum's latest immersive -- and incredibly Instagramable - art installation. Welcome to "Pipilotti Rist: Pixel Forest," a three-story journey filled with wild, psychedelic videos and a chandelier made of underpants. It's the New Museum's most popular exhibit to date, according to the museum. Yet what's really drawing crowds is the "forest" of 3,000 hanging LED lights, which change color in sync with floor-to-ceiling dreamlike video projections and hypnotic music scores. Visitors can walk through the "pixels" or relax on the installation's many beds and cushions. This is the first New York survey of the work of Swiss artist Pipilotti Rist, known for her video art and multimedia installations. It features pieces from her entire career, including a projection of "Ever Is Over All," which may have inspired Beyonce's "Hold Up." 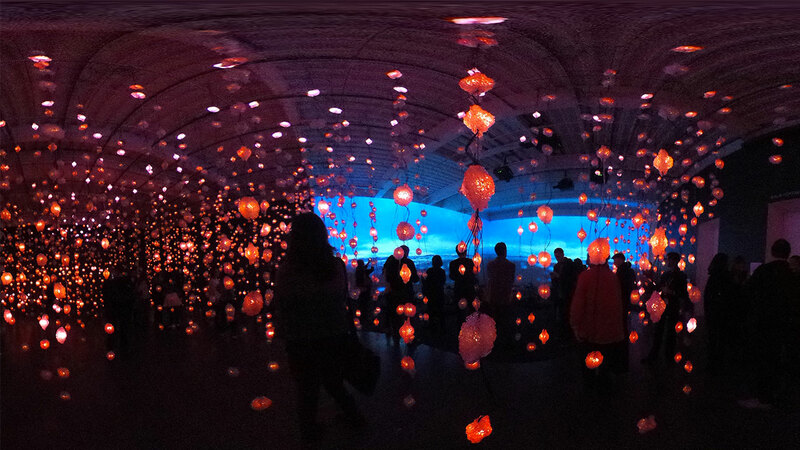 If you're looking to get lost inside the Pixel Forest, this weekend's your last chance. The installation will be open to the public 11 a.m. - 6 p.m. Saturday and Sunday at the New Museum (235 Bowery, on Manhattan's Lower East Side). Watch this 360 video in a Chrome or Firefox browser or use the YouTube app.